A UK team will study an area that has been hidden for thousands of years, until a giant iceberg broke away last year. A research team from the UK will be conducting a major expedition of a seabed ecosystem that has been hidden from view for thousands of years, and was suddenly revealed by a giant iceberg that broke away from the Antarctic Peninsula last year. The British Antarctic Survey has released some video of the iceberg that spans 6,000 square kilometers which was shot from a plane that flew along its edge. 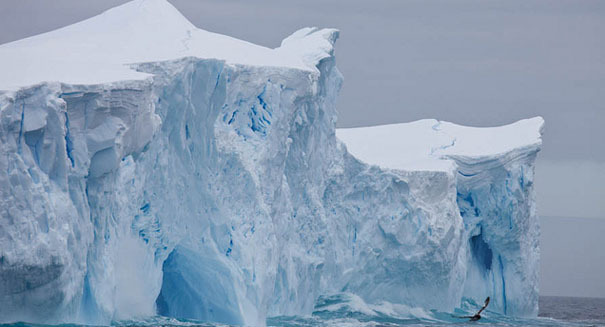 Over a three week period from February into March on the research ship RRS James Clark Ross, researchers will explore the Larsen C ice shelf where the iceberg disconnected from the continent. It will provide scientists with a major opportunity to study marine life and how it has been impacted by environmental change. It will be a very difficult journey fraught with challenges for the team, who must navigate ice-filled waters. However, this could provide some major breakthroughs in understanding the continent and climate change itself.